The data plate below the logo says Singer 15-. 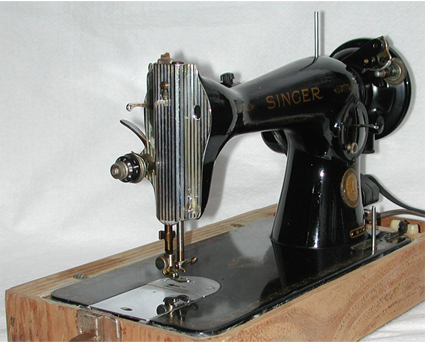 According to our limited research, the machine is a Singer Class 15-91. For a black machine of this era, it is unusual in that it has a direct drive. That is, the motor drives the machine through gears and not a belt drive. The motor can be seen in the image below. While direct drive may eliminate the problem with loose or worn belts, it does pose other problems. The motor is lubricated by grease cups which we have been reluctant to address. The machine sounds different from belt driven machines and certainly has a more positive feel--when you depress the speed control petal, it goes without hesitation. Its serial number is AL863228 indicating a manufactured date of 1954 in New Jersey. It uses Standard 15x1 needle. 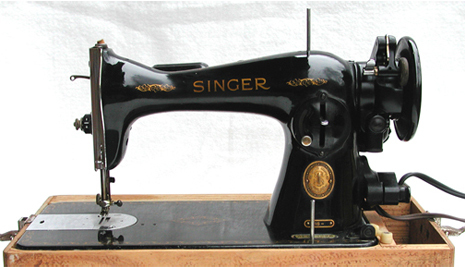 Bobbins are Singer Class 15. Feed dogs may be dropped by loosening a thumbscrew. Low shank. Aside from the type of drive, there are many similarities between this 15- and our Universal and Mercury units also shown on this site. This is especially true of faceplate design and threading pattern. See links on the left. Another oddity of this machine is that the needle is threaded from right-to-left as is the 15-88, 15-91, all versions of the 201, and 191J. The upper thread tension adjustment and take-up lever are on the back-side of the faceplate makeing threading slightly more difficult. You either have to hang over the machine to thread it, or rotate the machine around toward you--certainally easier to do with this portable than a cabinet model. However, once that task is accomplished, the controls are out of your way and forgotten about and are not a distraction. But if you like to stop the machine with the upper thread take-up lever in the up position, it is somewhat harder to see than if it were on the side toward you. 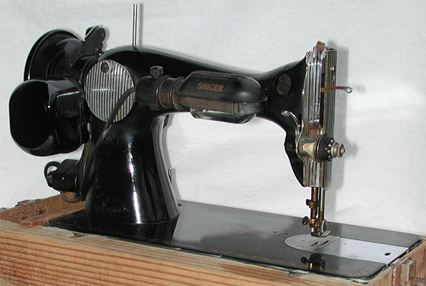 There were a lot of machines made by Singer and others with this configuration. Our other machine with a rear-mounted motor is in a cabinet. Its serial number is AD587547.